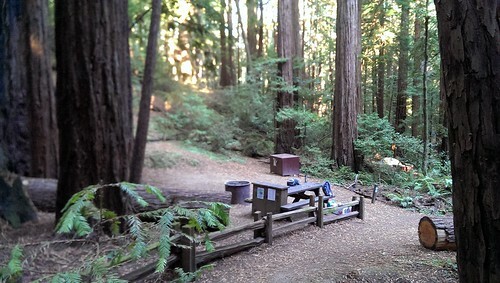 Many’s the time we’ve hiked, car camped and backpacked at Butano State Park, but never have we stayed at a walk-in site. Until yesterday. Site 22 is the farthest from the walk-in camp’s parking lot, probably 50 meters or so, but is in a lovely secluded spot in this forested dell near a spur from the Goat Hill Trail and its connection to the main campground and its facilities. So there’s some schlepping to be done in order to set up your camp, but worth the trouble. First I selected site 24, and the Resident Expert went back down to the park entrance to pay the fee. We encountered confusion and ruffled feathers at this point, because somebody else had already reserved 24. So I moved our stuff to 22, which was nicer anyway, and soon enough things were back at equilibrium. I still consider us to be Greenhorns in the camping game, but we follow the Continuous Improvement Model, and each trip further refines our camping mojo. This time we tried a one-dish solution for dinner. Amazing to say it now, but in our first camping trips we just super-imposed our normal routine to the outdoors, so there were main courses, side dishes, many utensils, and dishes to be done. Fairly soon it became clear to me that doing dishes at camp was not my idea of fun. So the one-dish solution was proposed. The one dish is a cast iron skillet, and you’re not really supposed to wash those anyway, so: perfect! We brought along some previously prepared Pasta Rustica (pasta, sausage, tomato sauce, multiple cheeses) and some veggies. Resident Expert suggested sautéing the veggies first and then working in the Pasta Rustica. The pasta didn’t hold up well, but in combination it all worked. We toasted a couple of miniature baguettes, opened another bottle of wine from Grocery Outlet, and capped the entire meal with a dessert of Halloween leftover Milky Way bars (fun size). Doesn’t that sound good? The camp had quieted down and we were enjoying the fire when, Raccoons! One on the ice chest. Another attempting to open the old wooden food locker. A third moving behind us to raid the new metal food locker, in a classic triangulated attack pattern. The Resident Expert leaped up to shoo them away, so I could just enjoy how cute they are. They came through the site one more time, and then vanished into the dark. But we heard their impact as they moved down through the camp. First, at the neighbors in 23. “Hey! Oh no! No!” Then down the hill in 24. “Go away! No! No!” Further down the line we’d hear people protest their arrival. No further incidents marred our stay at Butano, and we reverse-schlepped our belongings back to the car and drove down to Pescadero Marsh for a hike. It’s a beautiful place, with much to offer for the birding enthusiast, such as birds. 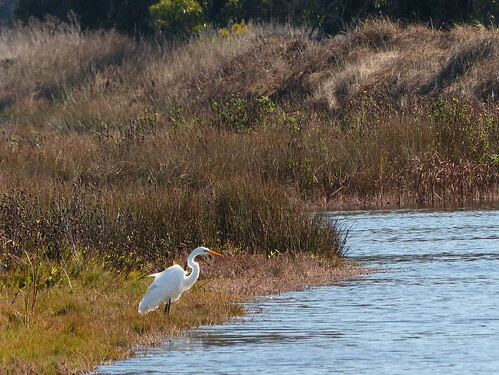 There are numbers of Great Egrets and Great Blue Herons here, among many other birds. 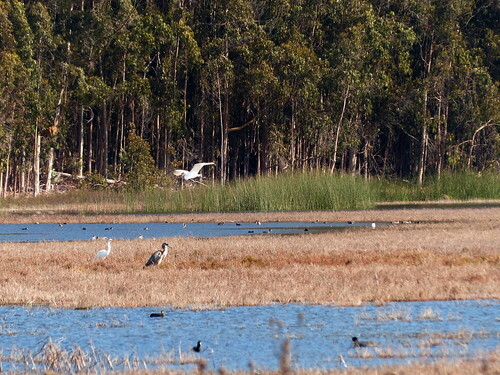 A heron rookery can be seen in a eucalyptus grove near the marsh. Really just an extraordinarily rich habitat here, and a strong argument to restore more of the coastline and SF bay to marsh lands, when the opportunity arises. 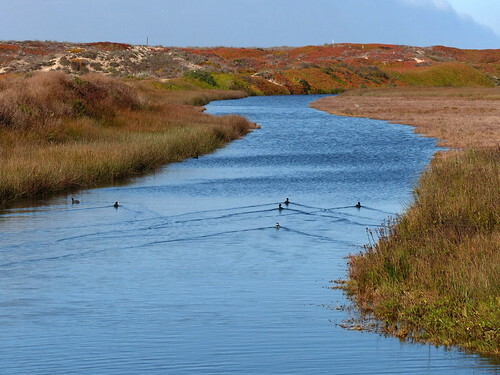 Pescadero Creek rolls right into the sea past the Marsh, so you can see all the great sea birds as well. 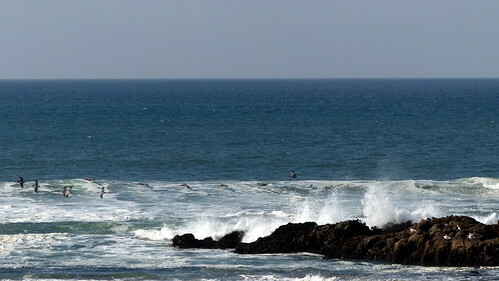 Here, a line of pelicans is riding the updraft from breaking waves. The over-wintering migratory birds are just starting to arrive, so we’ll definitely be back to Pescadero Marsh soon.